Helga Schmitz-Fernich Luden was born in 1934 in Ulmen, a town in the Rhineland region of Germany. Helga’s family was the only Jewish family in the town but members of the Schmitz-Fernich family had lived there since the 1800s. In 1939 Helga was sent with her mother to Gurs transit camp in the Basque region of southwestern France. While in the camp, her mother taught her how to make a quick escape if necessary and one night she was forced to so. Helga escaped to the woods where she was found by French-Jewish partisans and brought first to a convent and then to an orphanage. Helga’s mother found her there well taken care of, then they were taken in by a Catholic family near Marseille. 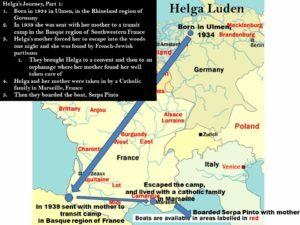 They were eventually put on a boat, the Serpa Pinta, and on the way to North Africa, Helga's mother was reunited with Helga's father, who had been in a slave labor camp. The boat later left for the United States. When the boat reached New York, it was not allowed to dock. The only country which would take the refugees in was the Dominican Republic. 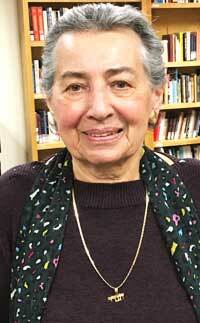 Her family settled in the seacoast town of Sosua, where Helga’s sister was born in 1942. 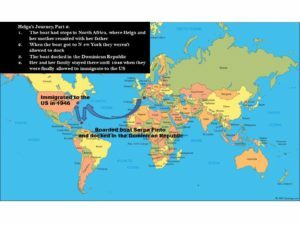 The family was not able to come to the United States until 1946.